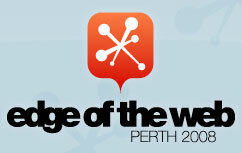 Follow Us On Twitter; Attend Edge Of The Web For Free! Eager to attend the Edge Of The Web conference, but your boss won’t cough up the bucks for the ticket? Or perhaps, with all this talk of a looming recession, forking out your own cash for an event like this is difficult to justify? Maybe you’ve already bought your ticket, but would love to take a friend along too? That’s it! It should take you, oh, about 2 minutes. Do this by midnight on Thursday, October 30th (Australian WST) and you’ll be eligible to win a ticket to the Edge Of The Web conference, of which SitePoint is proud to be a supporting sponsor. We’ll choose the response that we like the most, and award the ticket to that person. Derek Featherstone are presenting alongside a bunch of awesome local talentâ€”including past and present SitePoint authors like Lisa Herrod and Tim Lucas. If you’re unable to make it to Perth for the event, then you should still follow us anywayâ€”one of our lucky Twitter followers (old or new) will win a copy of the new SitePoint book that everyone is talking about, Everything You Know About CSS Is Wrong! The winners of this competition will be announced on this blog on Friday, October 31st. Good luck everyone, and catch you in the twittersphere!